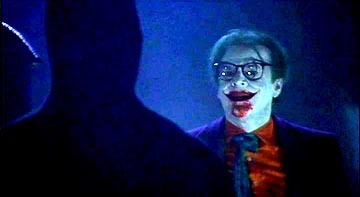 In Tim Burton’s rendition of Batman (1989), a demented and delirious Joker (Jack Nicholson) grabs a pair of horn-rimmed spectacles to try and elicit some mercy out of Batman (Michael Keaton). The strategy, of course, didn’t work. Fast forward to the 21st century, and communication technologies have advanced to the point at which eyeglasses are no longer restricted to the stereotypical meek and mild-mannered “Clark Kent” types (Author’s note: As a glasses wearer, I quietly reject this stereotype. #seewhatIdidthere). You wouldn’t hit a guy with glasses huh, would ya? To our Interaction Lab research team here at West Virginia University, Google Glass is thought to represent an augmented sociality — a device that provides conversational cues that would not normally be present in a face—to—face conversation. Some of these cues include social media content, profile information, or even the actual Glass device itself. Glass represents a cyborg—like face-to-face interaction in which the wearer could layer social information on top of the “normal” face—to—face interaction, similar to how some video games place digital objects into physical worlds in a game of Human Pac-Man. For some this augmented sociality might provide us the best of both face—to—face and computer—mediated worlds: we can look each other in the eye, and we can dial up information about each other on—demand without breaking eye contact. Of course, the promise of the Glass revolution has yet to be realized — that is, we’re not living an augmented sociality. In one UX Booth article, the software team at ELEKS provided a hand—on perspective on designing for Glass, outlining the challenges and limitations of developing programs for a device with physical and contextual limitations, such as a smaller and omnipresent screen, a lack of tactile interface, and a limited battery capacity. Others — such as Wall Street Journal’s Kevin Sintumuang — have highlighted the awkward social moments known as the “Glasshole” effect, during which humans walking the streets with conspicuous mounted technology are viewed as at best smug and elitist and at worst serial, cyborgic data—miners, invading the privacy of those around them. As of January 15, 2015, Google stopped all distribution of Glass but was quick to denounce rumors that the project was dead — although many have attributed the program’s “failure” to poor design. As a media psychologist, I take a very different perspective on the story of Google Glass. I suggest that the Glass experiment “failed” more as a result of negative public perception of the misunderstood technology, rather than concerns over the technology’s design and functionality. Below, I’ve shared what we have learned from the project, what the apparatus represents for human interaction, and what all of this means for UX design. In the study of communication technology, there are a number of models of technology acceptance that have been proposed. One of more influential ones — since updated in more recent work — was proposed by University of Michigan MIS researcher Fred Davis in 1989. Davis’ Technology Acceptance Model (TAM) is a very simple approach to UX design: technologies that are both perceived to be useful and easy to use are more likely to be adopted. This is not a paradigm—changing model of UX design, yet closer inspection reveals some surprising omissions. For Davis — and many engineers and media psychologists alike — the focus on technology acceptance is less about the technological capabilities of a given interface and more on the social perceptions of the technology. In the TAM model above, perceptions of usefulness and ease of use do not directly predict actual system use; rather, they predict society’s likely attitude towards the system, which in turn impacts user’s likelihood to explore the system. Put shortly, our attitudes have a remarkable impact on our behaviors (PDF). In the case of Google Glass, negative assumptions ranged from “I wouldn’t need it for anything,” to “it will probably be difficult to use.” While it’s possible that the apps designed for Glass were not optimized for the head—mounted display (as the ELEKS team discovered during the app design process), even before trying Google Glass, many would—be adopters were uncomfortable with the very idea of using a computer placed directly in their field of vision. In addition, the unfamiliar finger swipes and eye blinks (as opposed to a keyboard or touch screen) disrupted the mental models users held for mobile technology. Similar research on video game controllers has shown motion—capture controllers (such as the Nintendo Wiimote) result in frustrating experiences when the controllers don’t sync up with the user’s past gaming experiences. Moreover, our perceptions of both usefulness and ease of use also have external factors — one of the strongest being how our friends and colleagues view the technologies. Scholar Everett Rogers, one of the formative authors on the topic of innovation, sociologist and communication, wrote his authoritative em>Diffusion of Innovations (PDF) in 1962. Among the many findings put forward in his book, one of the more enduring is the logistic function that most all technologies — from hybrid corn seeds to the modern—day smartphone — seem to follow. 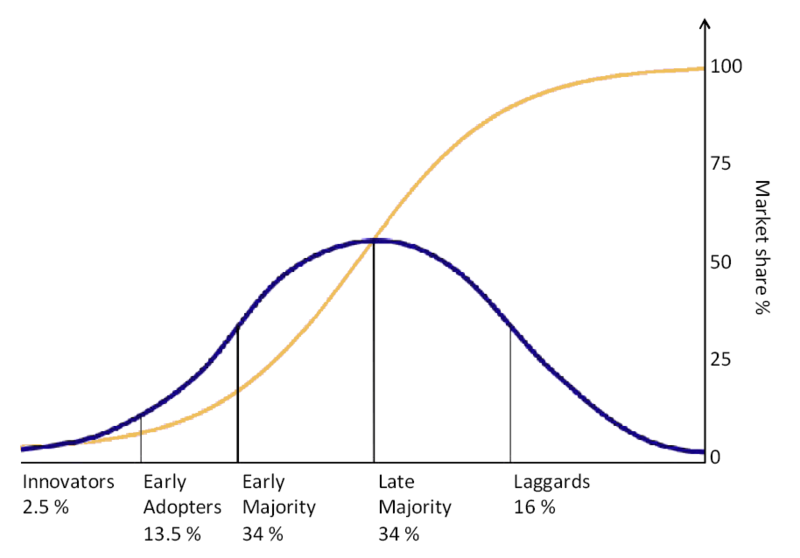 The Diffusion of Innovations model, as explained by Everett Rogers. The blue line represents the proportion of adopters for each category over time, while the orange line represents the cumulative number of people adopting an innovation. In the case of Glass, many of these factors worked against the technology. Adopters were mocked for being elitist, or at least connected enough to Google to earn an invitation, and wealthy enough to afford the $1500 Explorer price—tag. Social networks and blogospheres lit up with Glass-hate, and Google’s own Glass Explorers channels were under—utilized. The social system surrounding us — at least 72% of technology users — was expressly concerned about supposed privacy violations. As a result, the Glass Explorer program was halted only 23 months into its potential adoption cycle. 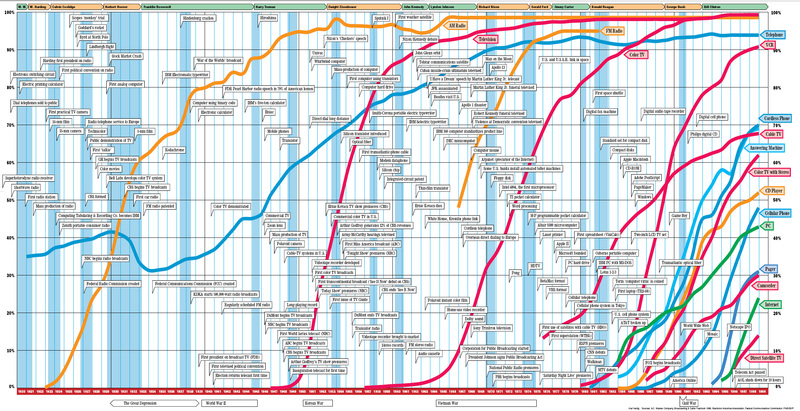 Technologies that can attain a critical mass of adopters (the “early majority” from the chart above) are the most likely to be adopted en mass, but the barriers to this critical mass are often the perceptual ones. As both Davis and Rogers explain: technology adoption is every bit as much social as it is technical. Even as groups such as ELEKS worked to make promising and innovative, user—friendly Glass apps, the Glasshole perception has thus far proven too much of a social perception for the technology to overcome: even Google itself put out a bulletin to coach Glass users on how to behave with their technology. What on Earth is ISO 9241?